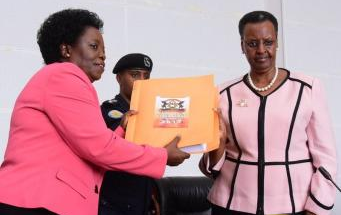 OPM OFFICE – Education and Sports Minister Janet Museveni has Thursday afternoon released the 2018 Primary Leaving Examinations. This is the third time Ms Museveni to release PLE results ever since she was appointed the political head of the ministry in 2016. A total of 671,923 candidates registered to sit 2018 PLE from 13,072 centres across the country compared to 646,041 from 12, 751 in 2017. This represents an increase of 25, 882 (3.9 per cent), according to the executive Secretary of Uganda National examinations board Dan Odongo. Of the total candidature, 476,131 were from Universal Primary Education (UPE) schools and 195,792 private. 2018 was the fourth year UNEB registered more females at 346,963 compared to 324,990 males. According to UNEB Chairperson Prof Mary OkwakoL, in 2018, UNEB registered an increase in the candidature by 3.9% compared to the 0.8% of 2017, this could be an indication that the districts heeded to your call that you sent out in 2017. She say that UNEB also recorded a tremendous improvement in the registration of candidates through ICT, fewer mistakes were made and schools completed the process faster.